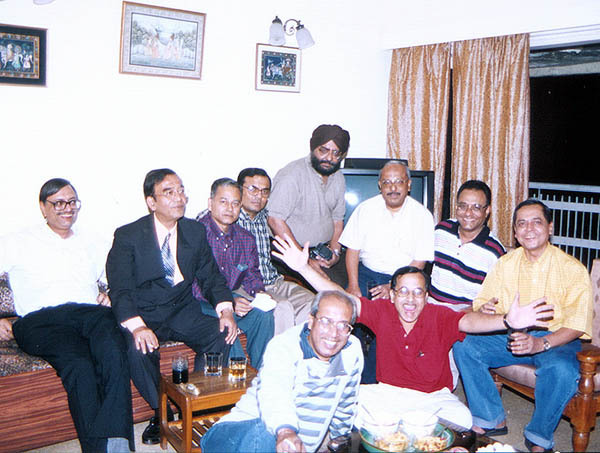 10 Classmates (IITkgp/ME/1974) Get Together After 28 Years! 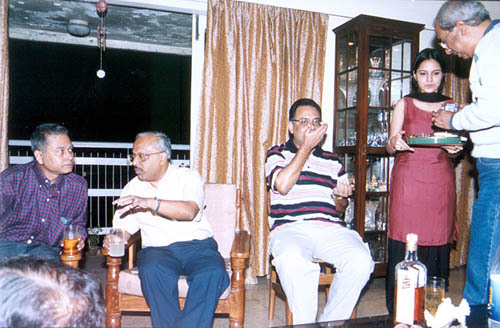 Pronob Banerjee, who is based in Indonesia, visited Kolkata in November 2002. 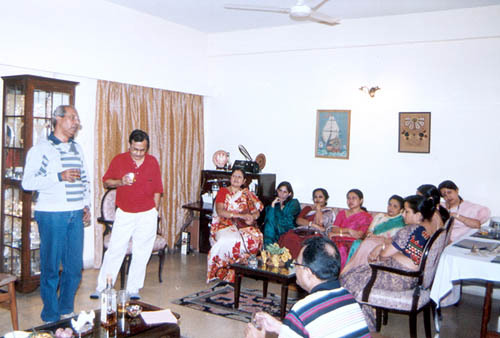 Jaya and I took the opportunity to organise a get-together of all our classmates at Kolkata. As many as 10 (25% of our total class strength) classmates got together at my place -- apparently the highest congregation of ME/74 at any one place since passing out in 1974. 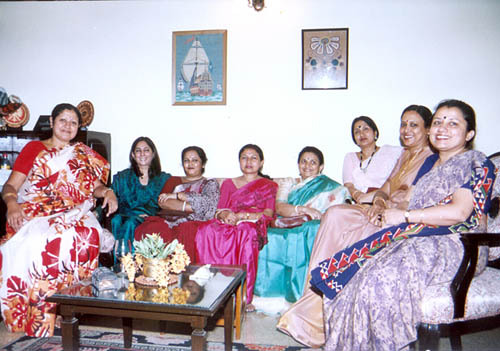 Some of us met for the very first time after 28 years and had difficulty in recognising each other. But once we linked the 'present faces' with the '1974 faces' it was back to Kgp days -- as if the last 28 years simply hadn't existed! The wives thoroughly enjoyed observing this 'regression' in their respective husbands. I would love to share these photos of the nostalgia-filled evening with you. N.B. : (1) Click on the thumbnails to enlarge them. (2) Optimise your monitor's contrast and brightness to see the photos clearly. é Bikramjit and Pronob are discussing something 'serious'. Rahul is busy eating 'Ujjala Chanachur'. Debashis' daughter Enid is serving eats to Asis. 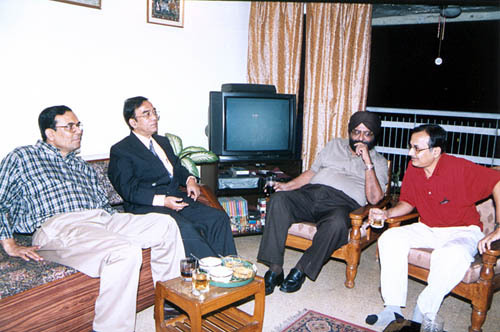 é Manohar, Ashoke, Udayan, Asis, Bikramjit and Pranab (sitting on carpet). é Manohar, Ashoke and Udayan. 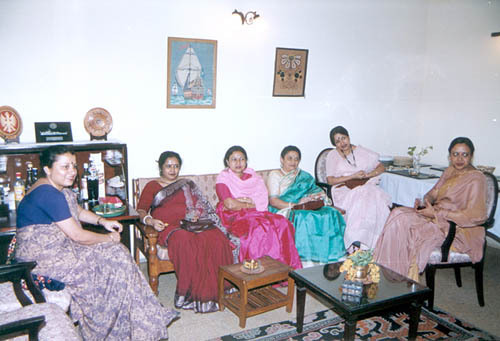 é The ladies' corner -- Jaya, Urmi, Mita, Sulagna, Shubhra and Gayatri. 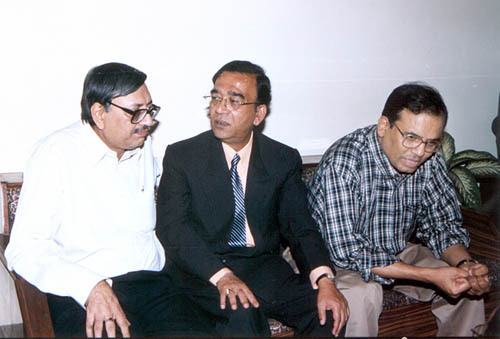 é Udayan, Ashoke, Saranjit and Pranab. é Asis regales everyone with a lovely song. Finally, it is time for group photographs. 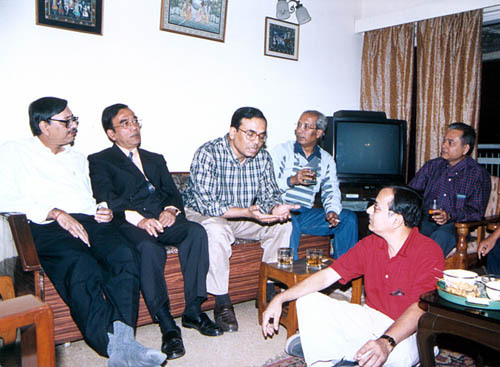 ç Manohar, Ashoke, Bikramjit, Udayan, Saranjit, Pronob, Rahul, Debashis, Asis (foreground) and a very boisterous Pranab.